OptiGene’s original mastermix for isothermal amplification – just add template and primers. Contains OptiGene’s proprietary novel GspSSD LF DNA Polymerase. Suitable for rapid isothermal amplification of DNA. Native reverse-transcriptase activity enables single enzyme RT-LAMP. A DNA target (VKORC1) was amplified from Human gDNA (Sigma). 25μl LAMP reactions were performed at 65ºC for 60 minutes on a real-time thermocycler (Roche LC-480) in duplicate. The ‘Time to result’ is defined as the time at which the amplification fluorescence value reaches a threshold of 10% of maximal fluorescence. LAMP primers targeting the VKORC1 gene were designed using LAMPDesigner®. OptiGene’s Isothermal Master Mixes (ISO-001 and ISO-004) show faster DNA detection when compared to the NEB Master Mix. OptiGene’s Isothermal Master Mixes (ISO-001 and ISO-004) were compared to NEB’s WarmStart LAMP Kit (DNA & RNA) [Lot:0021609]. ISO-001 and ISO-004 DO NOT contain a specific reverse-transcriptase (RT) enzyme. For a true comparison to the NEB mix (which contains a separate and specific reverse-transcriptase enzyme) 0.5U AMV-RT was added to the OptiGene Master Mix reactions (ISO-001 inc. RT and ISO-004 inc. RT). Standard ISO-001 and ISO-004 RT-LAMP reactions were also compared to show the excellent inherent reverse-transcriptase activity of the mix. A RNA target (Beta-actin) was amplified from Human Total RNA (Ambion). 25μl RT-LAMP reactions were performed at 65ºC for 60 minutes on a real-time thermocycler (Roche LC-480) in duplicate. The ‘Time to result’ is defined as the time at which the amplification fluorescence value reaches a threshold of 10% of maximal fluorescence. LAMP primers targeting the Beta-actin gene were designed using LAMPDesigner®. 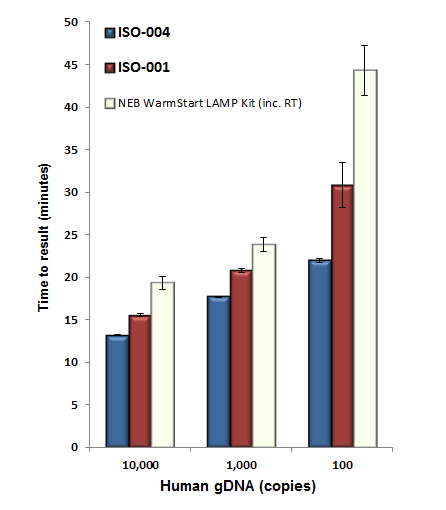 OptiGene’s Isothermal Master Mixes (ISO-001 and ISO-004) show excellent speed in RT-LAMP. 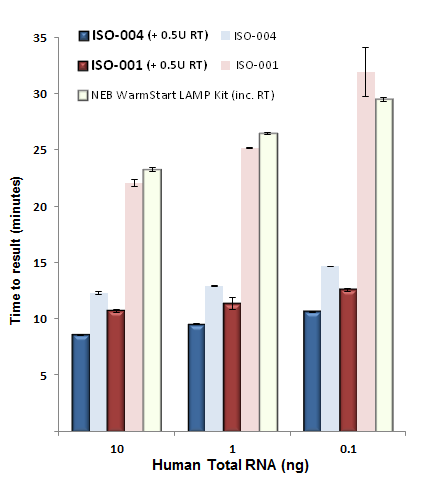 ISO-004 amplified 2X faster than the NEB mix, and almost 3X faster if a specific RT enzyme is added for a like-for-like comparison.